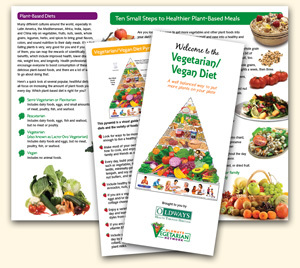 To create this updated Vegetarian & Vegan Diet Pyramid, Oldways brought together a world-renowned scientiﬁc committee to review extensive scientiﬁc data on plant-based diets and provide recommendations. Click here for a list of committee members. As Oldways’ decades-long exploration of the health beneﬁts of traditional diets reinforces, many variations of vegetarian diets have existed in diﬀerent cultures throughout history. This new pyramid reﬂects the vast variety of delicious, healthy foods, such as vegetables, fruits, nuts, seeds, whole grains, legumes, herbs and spices, that ﬁt into a healthy eating pattern. Best of all, this way of eating allows enjoyment of an abundance of delicious foods while consuming fewer calories, leading to better health and wellbeing. A plant-based diet can be an excellent source of all the necessary nutrients (protein, fats, carbohydrates, vitamins, minerals, and all nine essential amino acids) for optimal health, particularly when a wide variety of foods are eaten each day. Some vegetarians (especially vegans) may need to add supplements to ensure that they are getting all the essential nutrients they require. There are many ethical, dietary, and cultural reasons to follow a plant-based diet. Agricultural sustainability is a positive aspect as well. The industrial food system, heavily focused on meat production (beef, pork, sheep, and poultry, etc. ), is not sustainable. Plant crops (including grains, beans, vegetables) require fewer natural resources such as fuel, water, and land area than do livestock and poultry, making them more sustainable. Oldways Vegetarian & Vegan Pyramid has been created by our 10-member scientiﬁc committee to highlight the beauty and variety of whole plant foods that characterize healthy, well-planned meatless diets. It’s all about the food! This visual guide serves as reminder that it’s important to eat foods from all of the pyramid levels every day if you’re a lacto-ovo vegetarian, and from all but the top level if you’re a vegan. Although our pyramid features primarily fresh foods, please note that frozen, canned, and dried plant foods are also an important part of a healthy diet. The information below is presented as a general guide to serving sizes for moderately active adults. Additional servings may be needed for highly active individuals, and fewer servings may be needed for less active individuals. Our committee reviewed My Vegetarian Plate (General Conference Nutrition Council), Harvard School of Public Health Healthy Plate, and USDA MyPlate, to come up with these suggestions. If you have questions about speciﬁc foods or food groups or if you have diabetes or other health issues, we recommend that you seek the advice of a local dietitian to develop a meal plan that’s best for you. To purchase hard copies of the brochure, please visit our Oldways store.